ASPCA Mega Match-a-thon THIS WEEKEND at Dane County Humane Society! Help clear the shelter in preparation for spring! Dane County Humane Society announces the ASPCA Mega Match-a-thon event, A New "Leash" On Life, on March 31, 2012. Dane County Friends of Ferals and Sauk County Humane Society will join DCHS at the main shelter (5132 Voges Road, Madison WI) on Saturday March 31, 2012 from noon-5pm. Help Dane County Humane Society with Community Change! Here is a way to help DCHS that Mad About Pets just learned about today...Community Change! Community Change is a website that offers discounted gift cards for local restaurants, stores, etc. like Wando's, The Brink Lounge, Benvenuto's, Claddagh Irish Pub, and tons more. When you buy a discounted gift card through Community Change, DCHS (or several other charities, if you prefer) will get 20% of the purchase price donated to them. Click the image to check out Community Change's gift card deals! 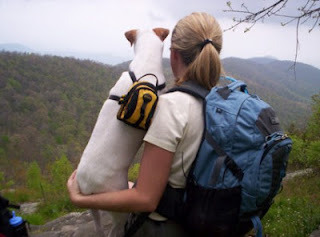 Guest Post: Don’t Miss Time Away From Your Furry Friend, Take Your Pet on Vacation With You! Enjoying a camping vacation by taking your four-legged friend along with you may be an excellent idea; however you’ll need to make certain that you are sufficiently prepared to see to your pet’s needs as well as your own. 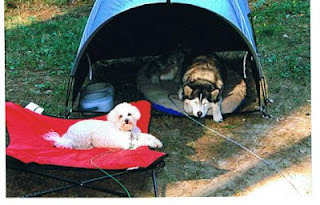 Before you visit a camping site always verify with the managers that animals are permitted. Whether it’s phoning ahead or asking at the entrance, it will save a lot of problems for both parties. Ensure that you possess a cage for your pet. It must be adequate for them to be comfy. Let your pet check the enclosure before traveling and see how they react in the confines, particularly if you are venturing for a lengthy travel. It might help your pet to settle in if you place a familiar quilt or cushioning within the cage too. Make sure they have sufficient drinking water for the trip and always carry an extra bottle with you to top up their water if needed. If you own a dog you most likely have the required gear to maintain them when out and about already, but it's not always the case for cat owners. Many felines are indoor pets and may be okay to stay inside the motor home for the length of the getaway. If this is the scenario you'll need to ensure that your caravan has good ventilation, or else it may get too warm on a hot day. Sometimes people buy leads for their felines so that they can come along with them on a walk. Others choose to let their cats wander free, but this may be a risk should they become confused and attempt to find their way home. There are electronic collar gadgets available that can be monitored and tracked, which could be beneficial in the event your cat goes missing. It is possible to vacation with cats, dogs and ferrets outside of the US too, on the “Pets Travel Scheme” (PETS). This scheme enables pets to travel between several approved countries and territories without having to be quarantined for six months. This is good if you are someone that likes to travel outside of your national borders and/or doesn’t like long periods away from your furry friend. To comply with PETS you’ll need to get your animal micro chipped, vaccinated against rabies and blood tested to guarantee an acceptable degree of security against rabies. When the pet returns to the country it must be treated for ticks and tapeworm no less than twenty four hours and no more than forty eight hours prior to embarking on the return journey. Your animal must travel from a PETS included country by a sanctioned route and with an authorised company back into the US. It is crucial you travel with all of the appropriate paperwork and evidence of all treatments. When travelling outside of the US you need to get an extra veterinarian certificate. If you don't have adequate proof that your pet is compliant with the PETS scheme it may end up being obtained in quarantine for six months or until you can confirm compliance anyway, which is the last thing anyone would want! The price of taking your pet with you on vacation via the PETS scheme can vary considerably depending on several factors, but you can find out more information here. Don’t overlook that you will require to have booster injections every once in a while and have the passport re stamped to confirm that your pet remains healthy to continue in the PETS scheme. And always remember that some nations have different rules regarding animal behaviour than in the US. For instance, in Switzerland certain types of dogs should always be muzzled in public areas. Taking your pet on a vacation can be wonderful fun if you are prepared. To ensure maximum pleasure and enjoyment always check the local guidelines of the camping area, country or principality and be sure you are in accordance with all legislations at all times. Ben Johnstone works for UK-based Caravan Free Ad service C4Caravans. He has a German Shepard called Dave and two cats called Bill and Ted! There are various possibilities for photo printing, and since the digital age it's become increasingly simple and cheap to decorate both home and office space with photos that mean something to you. There is something about animal pictures that warm our hearts and make us smile, whether it’s your own pet or a random photo of a cat with a funny caption! You needn't be a specialist photographer to take quality pictures of your four-legged friends either. Follow these straightforward tips and anyone can achieve great results. For the best possible photos, your pet ought to be looking great already. There is not any camera on the market that will perform magic, and much like a calculator; a camera is only as good as the person pressing the buttons. Taking a picture of your pet with a dull, dirty-looking coat will appear the same in print form as it does in the viewfinder. Put the maximum amount of care into the appearance of your pet as you would for yourself if you were having your own photo taken. The perfect time to snap away is immediately after a professional grooming session. Even if you are looking for an everyday casual photo of your pet, you should still take the time to carry out some simple grooming. Brushing by itself makes a huge improvement to the way an animal looks. Your pet will appreciate the attention too! 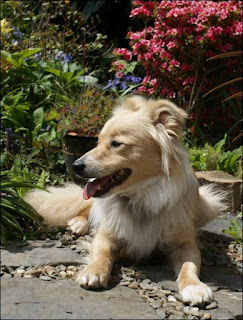 Don't be surprised if the photos you take show a more relaxed side to Fido or Fluffy! Contrary to what many people believe, it's not tough to get your pet to stay still for a photo shoot. I've developed a proven method through the years. It works like nobody’s business for me and can work for you too! Once the grooming is out of the way, feed your pet. Most animals are ready to nap after filling their bellies. If it isn't meal time or your pet isn't hungry, spend some time having active fun with your pet instead. The whole purpose here is to promote relaxation. When your pet is all wound down, give a gentle massage from head to tail. Trust me on this one. How do you feel right after a good workout and massage? Relaxed and tired? Exactly! Now that your pet is relaxed and won't want to go anywhere, take care of any final brushing or grooming needs and click away. You'll be blown away at how much cooperation you'll get using this technique. 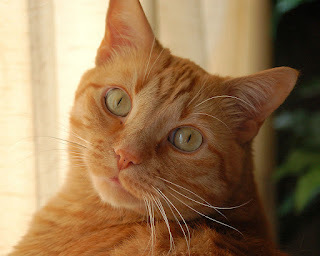 Using voice and motion, encourage your pet to look directly into the camera, slightly off to the side or with their head turned for a side-profile picture. Experiment with lights and props for atmosphere and the general feel of the photo too if you fancy pushing for further professionalism. And finally, when your pet becomes uninterested and drifts off to sleep, carry on and get some final shots. There is something very adorable about a pet slumbering away comfortably with one leg covered over their favorite toy or their nose nuzzled into a soft blanket! You're going to be so happy with the results using these tips that you'll most likely take the opportunity to shoot more quality portrait photographs whenever the chance arises! Whether sitting in special frames on your desk or enlarged into attention-grabbing wall posters, your pet photos are going to drag smiles out of everyone. And the best thing is there are so many options for printing you'll never run out of new ideas! Mary Dean is an animal lover who has developed various photography skills since marrying her professional photographer husband Gary 6 years ago.